The Walking Dead Road To Survival is now an exciting game app for Android and iOS, in which you can take on the role of a hero of the comic and TV series. Here you can find an overview of the best tips and tricks for The Walking Dead: Road To Survival. The app can be downloaded for free on Android smartphones and tablets, iPhone and iPad. 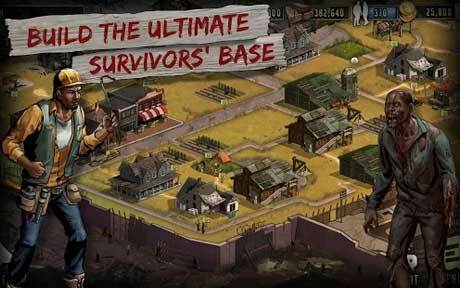 The Walking Dead: Road To Survival is a mix of building simulation and role-playing game. The game engages directly the action, got to see in the second season, the connoisseurs of TV series: the conflict with the governor and his subjects in Woodbury. The first step is to build your base to train skills for battle. There is also a role playing, evolved over the team and its your fight against enemy. - In the raids you fight against real players from around the world to climb with victories in the world rankings. - As you progress though the story you have to complete various missions and tasks. - Use the map to reach its additional tasks, which provide primarily new rewards, weapons and items. The basic structure is a core element of The Walking Dead: Road To Survival. - In order to bring the building to a higher level and to open a new field for additional building, initially the town hall must be expanded. - To ensure that no resources are wasted, the material stock should also be upgraded regularly. - In the workshop, items can be made, which can use in the fight. In the battle mode, your team is made up of up to six participants. Each member has unique characteristics with different core strengths. - Before fighting against the biters or human opponent you often can see their skills. So you can select your team according to the opponent's skills. - By using the icon on the screen you can also bring the skills of your troops to the screen once again. Select the weapons in accordance with the abilities. - In the battle screen enemies can be attacked selectively with a finger tip. About the arrow at the bottom of the screen the fighting can be taken over by the AI. - Generally, always attack the opponent who is closest. - With the "noise" can be particularly strong attacks are used. Look away the noise, for the most critical moments. - Biters are behind walls and other obstacles; do not send out your melee, use ranged weapons.